Good Waterproof Cycling Clothing: What Works, What Doesn’t? I live in the Vancouver area. It is a beautiful city with picturesque mountain views and the mildest climate in Canada. Sadly, it has one significant downside: rain. You might think that would deter many cyclists who prefer to commute by bicycle. Not so! Vancouver is shaping up to be the next Amsterdam with bicycle lanes and co-op programs. The truth is, a well-equipped rider can ride in wet weather in moderate comfort. A few good pieces of cycling rain gear will keep you dry and warm on that blustery ride to the office. That being said, the word ‘waterproof’ is thrown around a bit too liberally in the bike apparel world. Finding something that actually works is imperative, or you’ll end up right back behind the steering wheel. In this article, I’ve compiled a list of some of the best rain gear and clothing for bicycle riders. I will list 4 essential pieces to keep your ride dry. My purpose is twofold: I want to help you get properly equipped so you’ll arrive happy and dry, and also give a few shout-outs to awesome brands. It may seem obvious to cover yourself from head to toe, but there are some factors that you might not consider. Often, when faced with the intimidating (and expensive) wall of accessories at your local bike shop, you can be tempted to skimp; certain items might not seem terribly necessary. Here’s the thing: riding a bicycle in the rain comfortably all depends on your comfort tolerances. If you’re happy to get a little soaked, no problem! If not, you’re wise to invest in waterproof bike clothing from head to toe. Remember, even a light sprinkle can leave you soaked. Why? When travelling at high speed you’ll collect a lot of moisture along the way. In order to stay dry in all types of rain, you probably want to make sure that your most exposed portions are best protected. That means your front. All good quality cycling rain gear companies take that issue into consideration, and the front half will often be more reinforced, with windproof seams or sturdier fabrics. The waterproof cycling jacket is a no-brainer. Keeping your trunk dry and warm is mandatory for a comfortable ride. It’s tricky, however. We warm-blooded creatures are heat factories. You have a delicate balance between staying dry and being too warm. Airflow is key. Select bicycle rain jackets and pants that don’t breathe at your peril. Cycling rain jackets are cut a little differently than conventional outerwear. You’ll notice that the front is cut back, and the rear is extra long. Think about your cycling stance: this cut gives you ample protection while leaning forward, without interfering with your pedaling. Bike rain coats stop moisture in one of two ways: by using a membrane, or by utilizing a protective outer coating. Which of these two styles you select depends entirely upon the rain you’re expecting to see. In seriously wet conditions, a simple water-resistant windbreaker isn’t going to be enough. I recommend you get something purpose-built for bicycles, sturdy, and warm. Full-on, good-quality, waterproof cycling jackets tend to be a little bit heavier, and a little warmer. But that doesn’t mean they have to be oppressive! 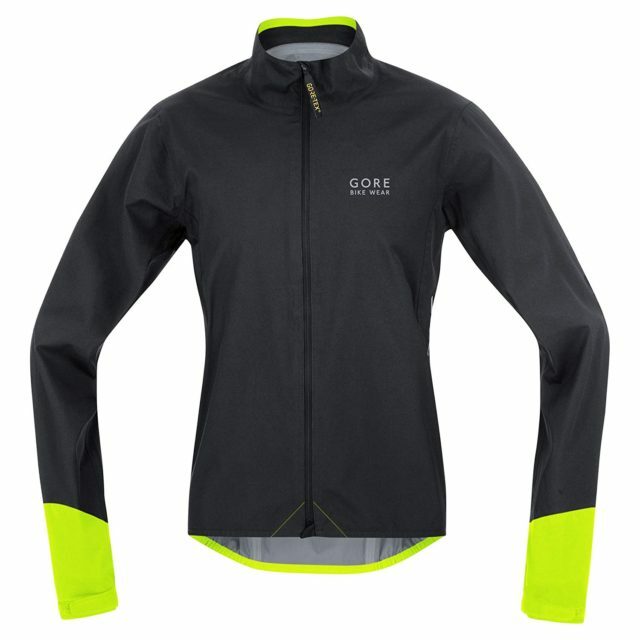 A great example is the Gore Bike Wear Power GT active jacket. It reviews really well and it has a lot going for it, including renowned Gore-Tex material construction. All the seams are taped, and despite its water-repelling qualities, this jacket breathes surprisingly well. The integrated LokSak bag is a nice place to stash a cell phone. It fits slim and attractively, with nice with reflective components. It will get a bit hot in milder, summer rain, so it’s a better option for wet winters and heavier weather. I strongly recommend that you opt for a shell in lighter weather conditions. Why? A shell is the most versatile option. First, most shells will scrunch up and pack away very easily. Secondly, a shell allows you to layer appropriately, so you can stay comfortable. They’re more breathable, and most will work well as a windbreaker in a pinch. An example of a fantastic shell is the Showers Pass Double Century ES. It’s a really nice looking jacket with a long back for extra protection. It utilizes Cocona Xcelerator fabric, which reflects moisture while breathing surprisingly well. It also features a form fit which won’t greatly harm your aerodynamics, and with taped seams and lots of reflective detailing, it’s a strong choice for any bicycle commuter riding in the rain. Other than the above recommendations, what are the beset waterproof cycling rain gear brands to look into? There are plenty of good options in the jacket realm, and you don’t have to spend as much as you’d think. As mentioned before, I think that Gore Bike Wear produces some of the best and most practical cycling rain gear on the market today. All their stuff reviews extremely well for rain and weather protection. Showers Pass is another brand I really like. They tend to have extremely breathable wet weather cycling clothing, and their price range is a bit more affordable than Gore. Giordana has a few fantastic rain resistant race options, and they’re worth a look as well. If you’re on a budget, Pearl Izumi has a good line of cheap cycling rain gear, and it does an admirable job when compared with the pricier brands. They can be found all over the place, though mostly online. Let’s be honest: rain pants will never look cool. But they’re an essential addition to your collection of waterproof cycling clothing, because nothing is worse than arriving somewhere in wet pants. Avoid those questioning looks and raised eyebrows by investing well. I don’t consider rain pants to be something you have to wear all the time. They’re something to be stowed in your pack, ready when needed. They’re usually fitted with an elastic waist and legs large enough to step through while wearing shoes. That way, you can pull over and slip them on very quickly. Waterproof bicycle pants are nothing like fitted cycle trousers; they aren’t intended to be aerodynamic or look all that great. They’re pure practicality. 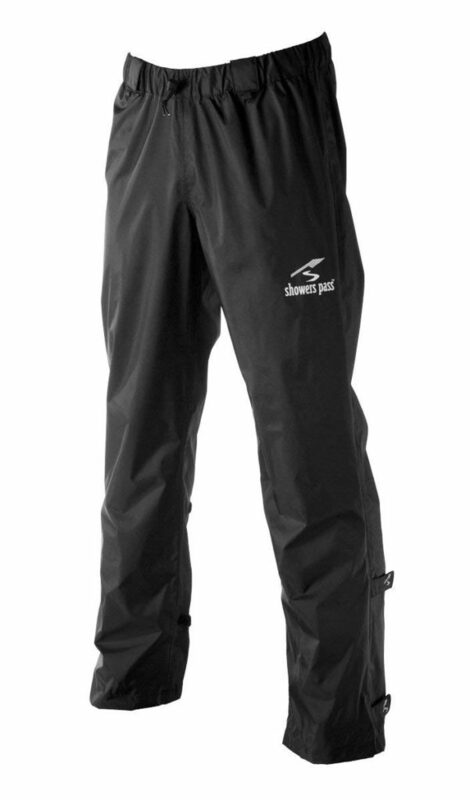 Showers Pass has produced a good, water resistant shell pant intended to keep you dry during a sudden cloudburst. The seams are taped, and the rip-stop poly material will keep your legs warm in wind as well. The elastic waist and generous leg room lets you slip them on quickly. They come with a stash pack, so you can stow them effectively. If those don’t do it for you, I have a few other recommendations. Craft produces a good set of cycling pants for wet weather commuters. They’re rated for lots of wind and weather and personally I think they look pretty good. And of course Gore Bike Wear has some awesome selections, truly waterproof. Their stuff is all on the pricier side, however. You don’t strictly HAVE to wear pants. I see a lot of people ride to work just wearing a good, water resistant cycling jacket and race shorts. That’s a good option too. The nice thing about spandex is it dries very quickly. Just be sure to have a towel and a spare set of dry clothes waiting so you can change. Wet weather cycling clothing has come a long way. However, it still tends to overlook one significant portion of your body: your feet. Water will naturally run down your leg in a downpour. Any guesses where it likes to pool? To keep your shoes from squishing, there are actually pretty limited options. The first is simple to ensure that your shoe’s outer construction is water-resistant. Option two is to just find a long rain pant that can cover your shoe, though that’s often awkward and your success may vary. The ideal option in a torrent is the waterproof bicycle overshoe. These wonderful things work much like you’d imagine, fitting over your shoe and providing a water resistant barrier. At first glance, they might seem awkward, but once you’ve used an overshoe in wet weather riding, you’ll be surprised that you lived without them! 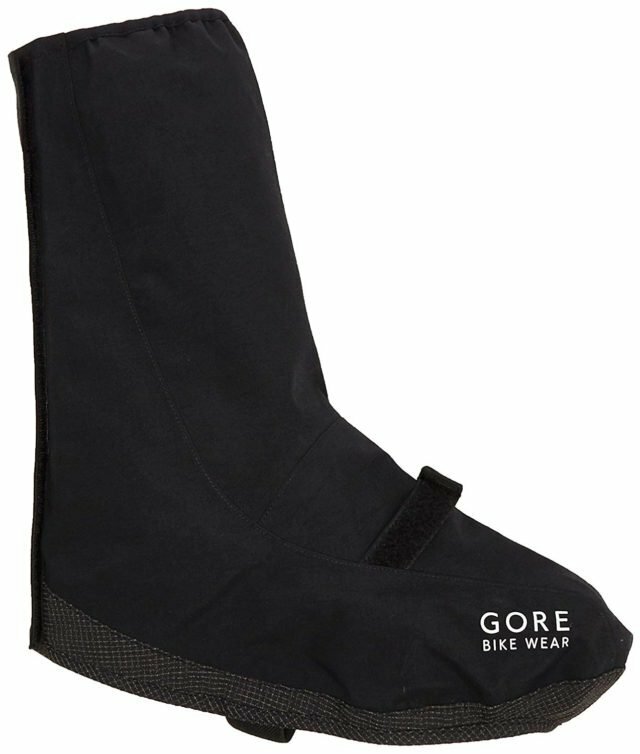 Gore produces an awesome, all-weather cycling overshoe that I’m crazy about. It provides excellent water resistance and even a bit of added warmth in the colder winter months. It’s great for avoiding mud too, if you’re a cyclocross junkie. The Gore-Tex outer shell is adjustable and easy to put on. It is compatible with all major clipless systems, and (probably most importantly), the overshoes themselves fold up nicely to stow in your pack. They’re one of the best waterproof shoe covers, and they make a great addition to cycling rain gear pack. If you want to preserve your shoes, these are something I seriously recommend. Pearl Izumi has a pretty affordable waterproof bicycle overshoe called the WxB Overshoe, part of its Elite Barrier system. But for the most part Gore has the corner in this market; they’re the prime brand to look at. When it starts to rain and I’m unprepared, my biggest concern is actually my bag. Many panniers, backpacks and saddlebags aren’t built with rain in mind. I don’t mind if my body gets soaked. But my laptop? My cell phone? Yikes. Fortunately, we live in a golden age of waterproof cycling bags and accessories. You no longer have to stow your computer and phone in attractive plastic baggies. I’d go with a pannier bag. The lower centre of gravity and easy installation make them worthwhile. But the bag itself should be watertight. Backpacks can also be a good choice, though they tend to get wetter on your back. And personally, I find that riding in a storm with a backpack on just feels ‘icky’. Be sure that they’re truly water resistant. For material, nylon can be quite water resistant, depending on its thickness. Waxed canvas or cotton is a very good choice as well, and generally holds up for years. One of my favourite companies for backpacks is Giro, they have a few commuter packs that feature subtle good looks, welded construction, a waterproof material (including the zippers), and an attractive and user friendly rolltop. 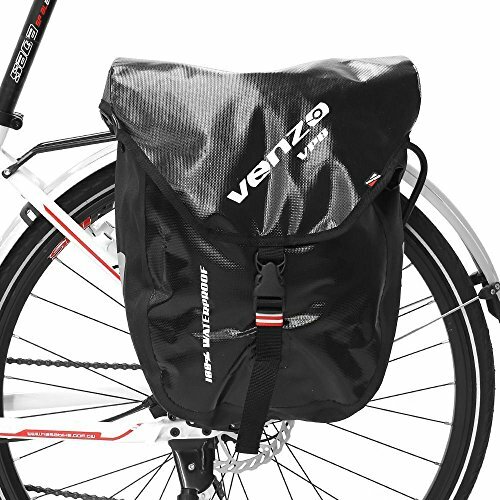 If panniers are more your style and you’re hoping to save some money, I’d recommend checking out the Venzo Pannier set, which was built with rain in mind. It features a welded 600D nylon construction, as well as integrated hooks to fit just about any type of rear bike rack with quick and convenient removal. The Venzo has a really smart system that features a dry roll enclosure system that rolls down on each side, for extra protection. If you’re hunting for something that marries form and function, Brooks has a series of fantastic roll-up panniers made out of waxed canvas. They’re probably not quite as water resistant as the Giro or the Venzo mentioned above, but they’re made from natural materials and look much more stylish. Timbuk2 has some excellent, affordable, waterproof cycling gear and bags that are made from synthetics, and they can be found in many bike shops. The recommendations above are all items that work for me. Of course, when it comes to finding the “best” jacket, pants, shoe covers and bag for cycling in rainy weather, you’ll find a lot of mixed opinions, especially from commuters. What do you use? How’s it working for you? Ultimately, read plenty of reviews before any purchase. Be aware of sizing (whether it fits small or large, etc. ), and keep in mind the kind of cycling you intend to do. My biggest piece of advice is that you should always layer. Use shells, dress warmly, and be prepared for warmer weather, because someday soon that sun to burst through the clouds! so true even a light sprinkle or mist can leave you we through when you’re cycling. I remember the first time I rode my e bike to work after only ever using it for leisure purposes on nice days and there was a heavy mist outside. I was so unprepared and arrive to work pretty wet! and I am not good when it comes to discomfort. Unfortunately while my workplace has shower facilities I didn’t bring a change of clothes. Now waterproofs are my best friend and I’m always on the hunt for the next best waterproof. I suggest you to check out the VeStorm raincoat by Vesthold. This company produces high-performance outerwear for outdoor professionals.They have developed a stylish and innovative raincoat for commuting cycling full of interesting features such as the Flexhold Bike Convertible System based on two lateral zips which open to release a skirt area which increases leg space so there is no loss of movement. Also the Easehold design creates a protective bubble which isolates the body from exterior weather conditions without constraining the wearer. It is light (850 grams), waterproof and breathable. Perfect for commuting cycling.